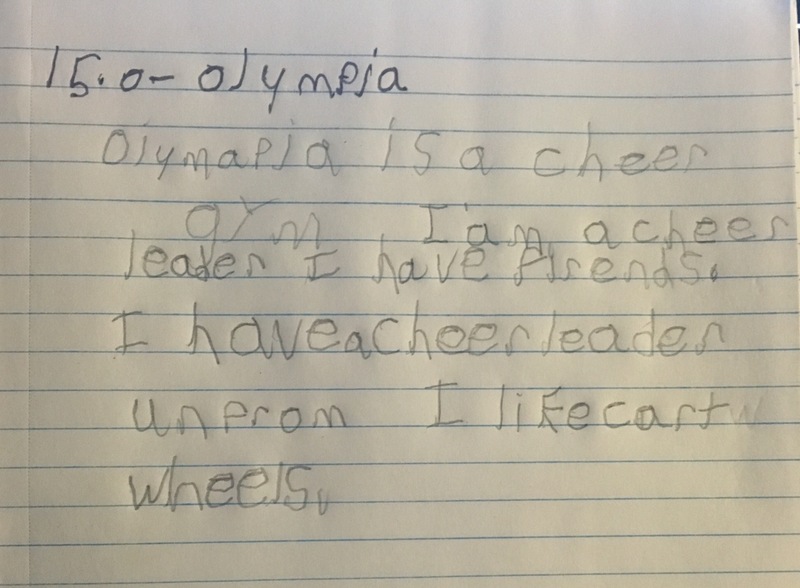 For the letter O, in our A to Z Challenge, Emil picked Olympia as in Cheer Olympia, Emily’s cheer club! Olympia is a cheer gym. I am a cheer leader. I have friends. I have a cheerleader uniform. I like cart wheels. Once again, thank you Cheer Olympia… Thank you Lorraine and Colleen and many thanks to our wonderful coaches: Celine, Megan and Chloe. You ladies are the best! This entry was posted in challenge, Cheerleading, Family, friendship, Gratefulness, Life lesson, parenting and tagged 5p-, a to z challenge, cheer, Cheerleading, cri du chat syndrome, Family, friendship, Life lesson, parenting, Special needs. Bookmark the permalink. You look fabulous in your cheerleading outfit. My great niece does cheerleading but it’s not as big a sport in Australia as America. My daughter is 10 years old and loves doing cartwheels down the beach. I used to love doing cartwheels too! Cheerleading is becoming quite a big thing around here where not that long ago I felt it was more popular in the US as opposed to eastern Canada. Emily loves it. Her first competition is this coming Saturday (the 23rd). Please tell Emily I really look forward to her posts. She does a great job! I will! Thank you very much for reading and commenting! Of course, I love your site! Aww, you are sweet to say so. Thank you so much! Good job Emily…:) I missed your writing.